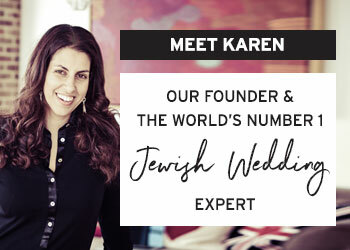 Todays couple had a bagel themed wedding, inspired by their surname, with bagels brought in from the legendary Beigel Bake in Brick Lane… I mean, could this Jewish wedding get any better?! Well that does make me happy! 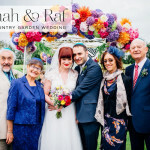 Nicola & Simon got married in Bevis Marks, the oldest synagogue in the UK, and a stone’s throw from their reception venue, The Andaz, in the City of London. 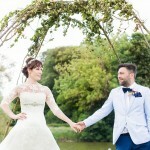 The bride wore a sensational fishtail Justin Alexander dress, and looked absolutely incredible. 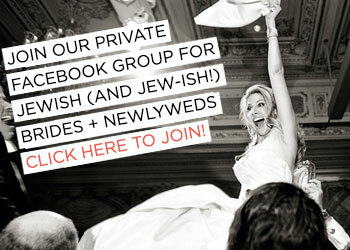 Her bridesmaids rocked Jenny Packham, and just wait till you see the Jewish dancing images – off the scale! Oh.. and they also had the most wonderful hashtag printed inside their kippot ‘#BestKuppleEver’. 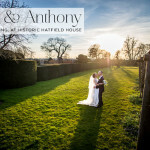 This is SUCH a lovely wedding, I hope you enjoy it as much as I did! 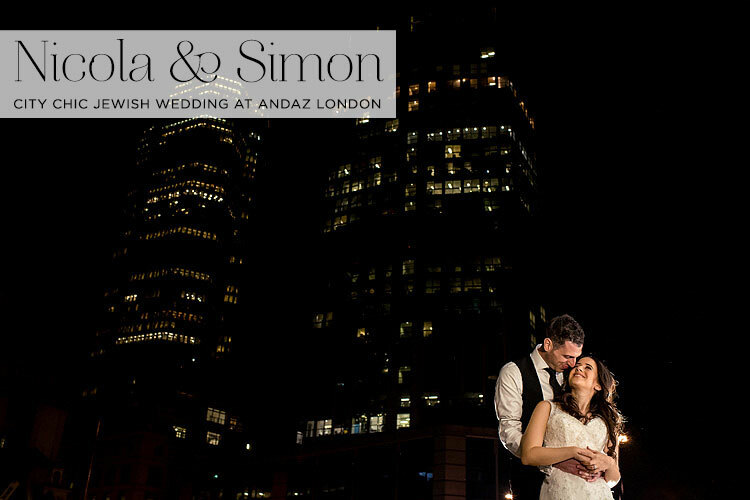 Nicola & Simon, the Bride and Groom: We got married at Andaz London Liverpool Street in the City of London. 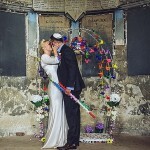 We had always wanted a London wedding – in a unique venue which few people know about and few also had held their wedding at. 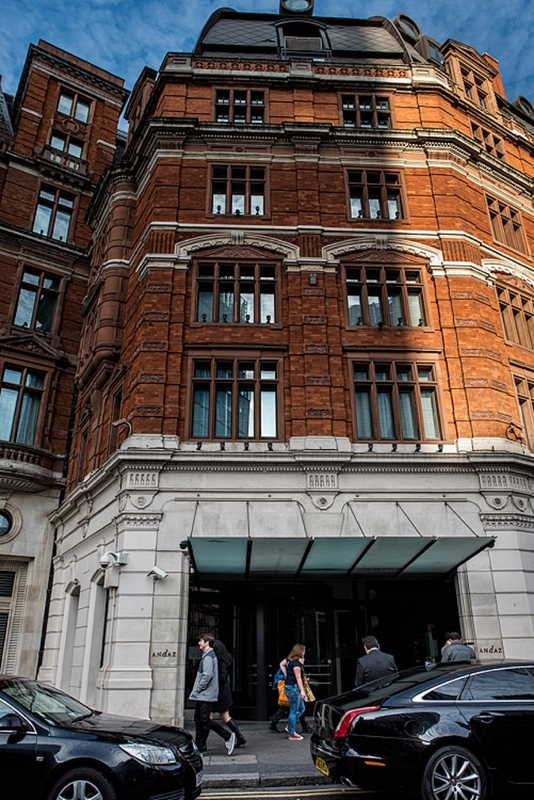 We fell in love with the design, vibe and architecture of the hotel. The smell is amazing too (they have a signature fragrance they pump throughout the hotel). The location was pretty handy as well, being right near Liverpool Street station, as it meant everyone could drink and jump on the last train. We did everything ourselves and (happily!) invested a huge amount of time and planning. We didn’t have a specific theme but we wanted our wedding to be bold and contemporary, which tied in with the venue. 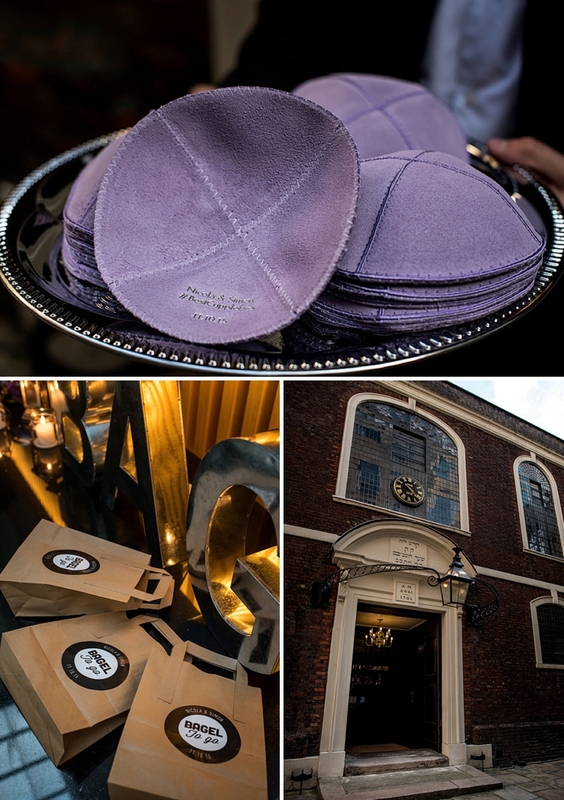 Our colours were light grey, dark grey and purple, and we wanted to ensure that everything met the same identity, from those colours to the typeface, to the language used in our stationery. 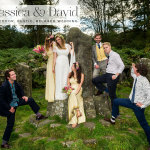 The absolute key thing for us was wanted to ensure a vibrant, fun, informal atmosphere, so we had made sure we organised some surprises and really fun moments on the day. From the branded YoBagel frozen yoghurt trike (we love FroYo) at dessert, to an eye-catching photo booth by Megabooth at the start, a garage session during the dancing and finished off with a specially branded ‘Bagel To Go’ takeaway goodie bag complete with bagels inside it at midnight. I worked with my designer colleagues to brand up both the trike and goodie bags. 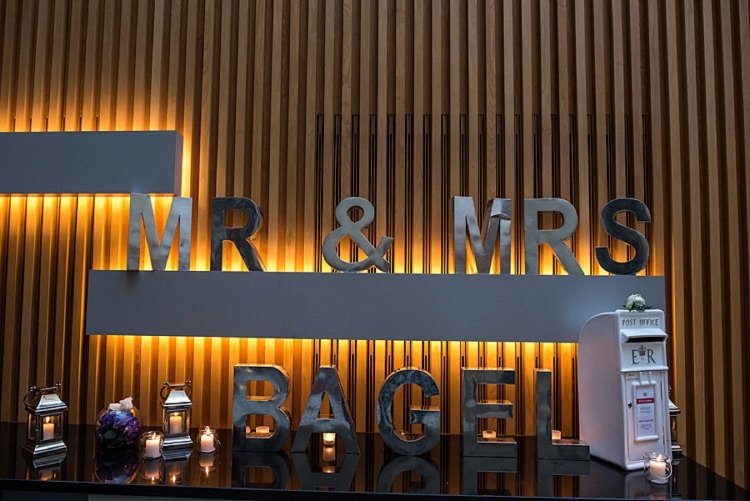 We also had custom metal signs of MR & MRS BAGEL (by Love Light) lit up in reception. For our invitation we wanted to create something inline with the venue and feel. 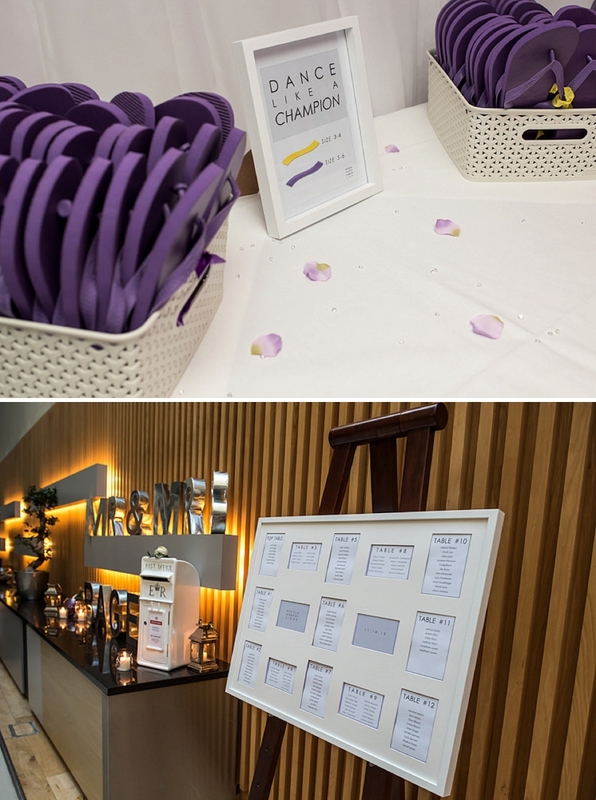 We worked with an invitation woman who really pushed back on our ideas at first, but in the end she said it was one of the most impressive ones she did and even her printer gave amazing comments. 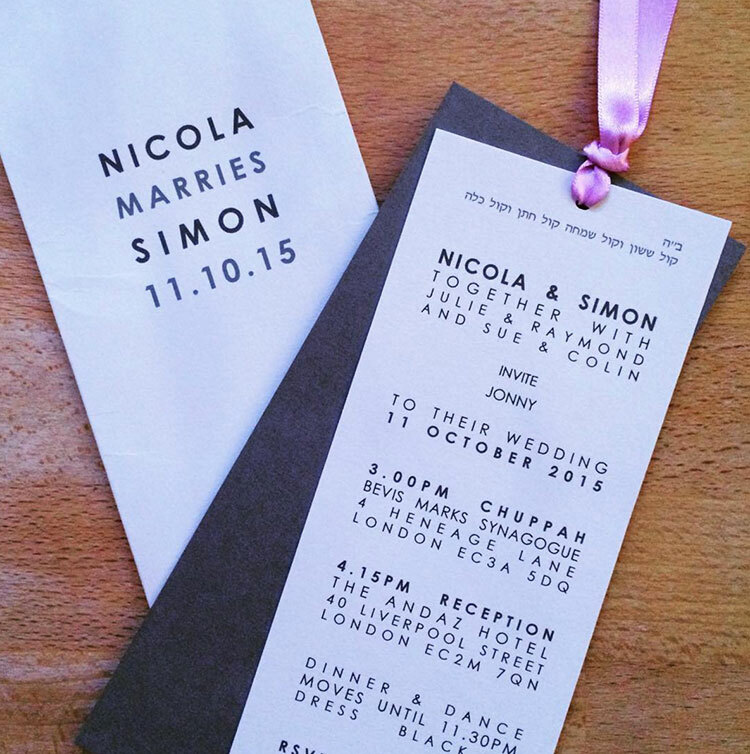 The invitation was slim and neat and held in a pocket/sleeve. We wanted something that the guests could immediately get involved with, so the pocket design played into this as they had to pull it out. The type face was slim and elegant and we kept the copy as short and to the point as as possible, based on points rather than a usually written styled invitation. 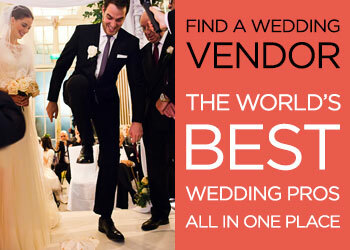 I also chose to have a plain floor length veil for a dramatic effect. 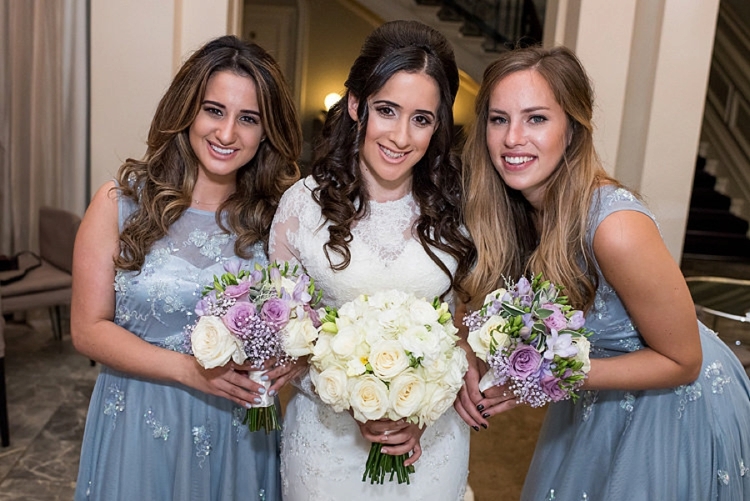 Both my bridesmaids wore Jenny Packham dresses in light grey. My flower girls all wore bespoke dresses made for them individually from Isabella-Mai, featuring light grey and lilac flowers sewn in the dress. Simon wore an all black, slim three piece suit with black tie, mother of pearl tie bar and cuff links, with a pocket watch and double length chain (my grandad’s pocket watch) creating a slight gangster look! We received a fantastic service from Jack Bunneys. 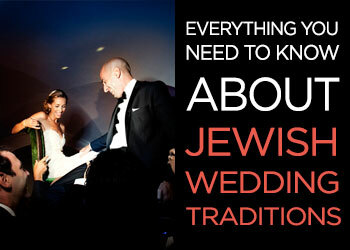 We had our wedding ceremony at Bevis Marks Synagogue, a 5 minute walk from Andaz. We liked having the change of scenery of two venues to break the day up ..and also the contrast of environments from historic and formal to contemporary and design-led. We found Shaun Taylor through Smashing The Glass via an advertising banner. We saw his work and it was exactly what we were after. Bold, super vivid, glossy, and every image just had so much personality — you could just read the vibe off them! We also loved that his images were not in the slightest bit cheesy or overly romantic. They were un-staged and candid, and right after our Skype session we had 110% confidence in him. We knew he was our man. We chose a band called The White Keys. 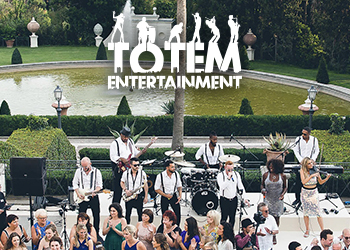 We saw them at a showcase event and they blew us away with their energy, incredible vocals and music choices. The garage set was the deal breaker though. We bought empty glass jars and filled all our male guest’s jars with popcorn, and our female’s with mini marshmallows. We tied labels to them to also act as a place names. We chose this idea as we wanted to have the table as clean as possible from unnecessary elements. Our cousin was our MC! We involved our family through speeches and asked our cousin Shaun to be MC. 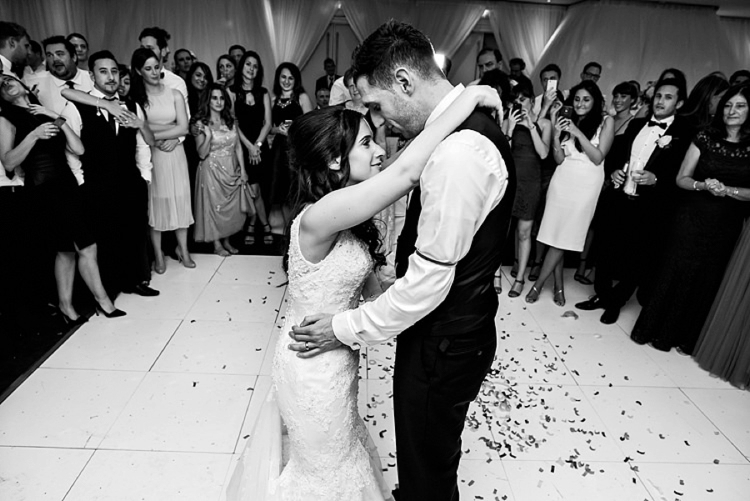 We wanted an MC but didn’t want an impersonal, formal feel and look, so Shaun did it and his welcoming, friendly nature, and fresh face made the absolute perfect job. He even got asked after if he did it for a living! Simon: My mum made our wedding cake! She used to do cake decorating in her spare time years ago which was pretty handy. 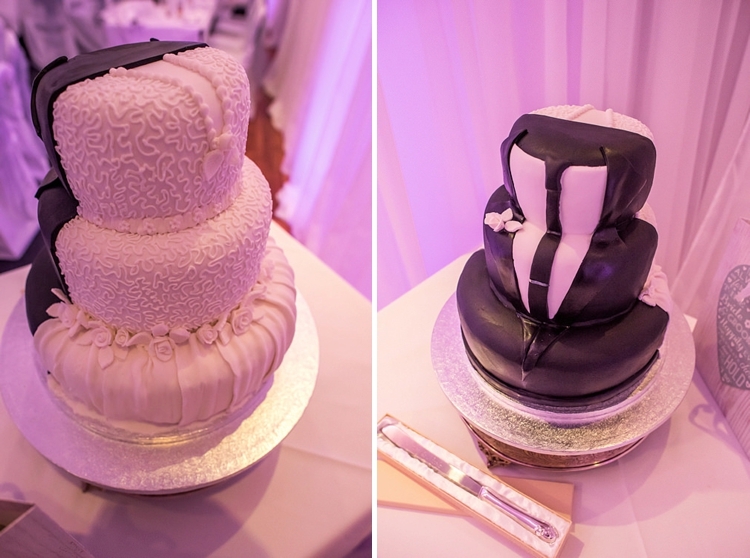 We chose a split 50/50 design with a half suit / half dress with a fruit cake filling. The design matched what we were wearing to the detail! Do as much forward planning as possible. We wrote our own wedding planning timeline months before and finalised it two months before, and sense checked it with every supplier and adjusted accordingly (doing so over the phone and then confirming by email). Share the time plan with some key family members, and hopefully they will do the chasing in the background to ensure everything goes according to plan.